This article was first published in Issue 142 (Jan-Mar 2018) of Renew magazine. If you’re planning to go all-electric—to reduce your bills and carbon footprint as suggested by Renew analysis—you’re going to need an electric cooktop. Not so long ago, that meant an element-style cooktop with all the downsides that went with that: slow response to turning the heat up or down and the consequent risk of burnt fingers (or melted implements) as the elements stayed hot for a long time after being turned off. Many keen cooks favoured gas cooking for these reasons—but induction cooktops are changing that. In Renew, we’ve recently covered several stories about readers’ satisfaction with the switch to induction; in fact, many would call themselves induction converts who would never go back to gas. Fans of induction cooktops cite many advantages—fast performance, excellent temperature control from low to high, increased safety as the cooktop doesn’t get as hot, ease of cleaning of the flat surface and, last but not least, energy efficiency. There are a couple of disadvantages which can make the switch more costly for some. One is that you may need to replace your saucepans and frypans. Most new cookware is induction-compatible, but some older cookware fails the ‘magnet’ test. See ‘Cookware requirements’ for more on this. Another potential cost is that you may need an upgrade of your electrical switchboard or the wiring to your kitchen. Induction cooktops have varying power requirements, but all are likely to require 20 amps or higher, up to 42 amps. See ‘Installation and power requirements’ below for more on this. 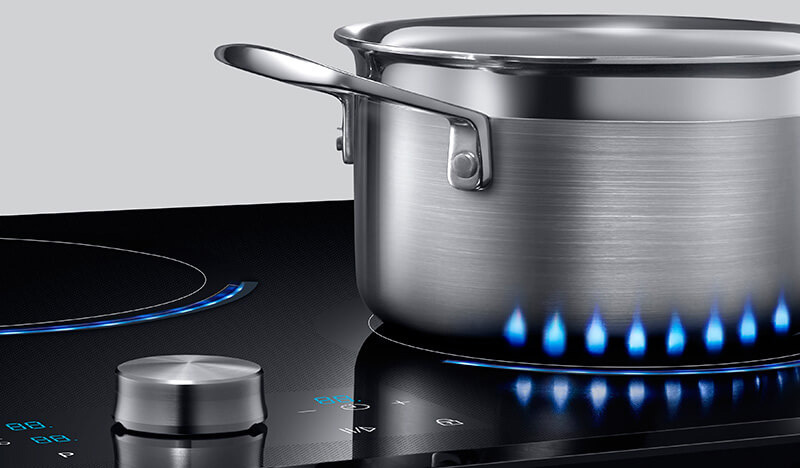 The speedy performance of induction cooktops can seem like magic, particularly if you’ve experienced the slow response of electric element cooktops. But it all comes down to science. They work by producing an oscillating magnetic field. Because the magnetic field is constantly changing, it induces a matching flux into any magnetic cookware on the cooktop. This induces very high currents in the cookware, causing the cookware to get hot due to the metal’s electrical resistance. Because the pot is heated directly by the magnetic field, the amount of power being fed to the pot, and hence the running temperature of the pot, can be varied almost instantly, giving induction cooktops heat control capabilities as good as or better than gas. When you’re buying an induction cooktop, there are a few considerations to make sure that the cooktop you buy will suit your needs and will be easy to use. Countertop, oven unit or portable? The first consideration is what type of cooktop you want. Do you want it as part of a freestanding oven or built-in to a countertop—or are you looking for a plug-in portable option? You’ll have the most choice if choosing a countertop option. If you have an existing freestanding oven with gas or electric cooktop, you will need to replace the whole unit, either with a separate oven and cooktop or with a new oven/induction cooktop combo (though there are fewer models like this available). For the best environmental result, you may want to delay this until the oven has reached its end of life or is not performing well. If the oven is in good nick, look for reuse options, or recycling otherwise. See ‘Recycling of old ovens and cooktops’, below. A portable induction cooktop can be a great way to see whether induction cooking is for you, but be mindful of generating e-waste if you’re planning to replace it with a full cooktop. Perhaps you could share a portable cooktop with your local community for trial purposes (the ATA has one which has been used by many in the office during renovations and to try out induction cooking!). 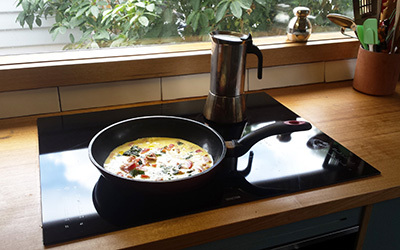 Portable cooktops can even be a long-term option: one ATA staff member has a good quality portable cooktop and is thinking of buying a second to replace their five-burner gas stove. Most people will likely choose a countertop cooktop. For this, you’ll need to check both the width and height of the space. Induction cooktops sit recessed into your countertop and though they are as little as 50mm thick, they need space underneath for ventilation—you need to check the manufacturer’s installation specifications for ventilation requirements. You’ll also need to keep in mind that if you’re installing the cooktop above an oven, the oven must also have a cooling fan. 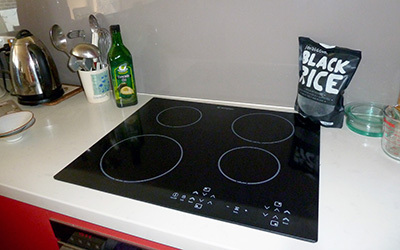 The two most common cooktop widths are 60 cm and 90 cm. Your choice may be constrained by the space available, particularly if you’re replacing an existing cooktop. Narrow cooktops are also available, with units as narrow as 28 cm now available from manufacturers such as Midea, Fisher & Paykel and Westinghouse, among others. You can also get 70, 75 and 80 cm units. The optimal size for you will depend on how many pans you want to have on the go at once. Rebecca Ciaramidaro from Choice says that a 60 cm cooktop comfortably accommodates three cooking zones, a 75 cm can have four zones, while five cooking zones work well with a 90 cm unit—any more and the cooking area can get cramped, particularly as the controls are generally on the cooktop surface. You want the controls to be a sufficient distance from the cooking zones to avoid spills onto them. Spills can mean the touch sensors don’t register your fingers. Wiping up the spill fixes this, but in the process you may accidentally change the settings. A pause function comes in handy here, to ensure your cooking settings aren’t changed while you’re attending to spills. When it comes to cooking zones, some cooktops have defined circles to highlight the zone, while others mark the zone with a cross. For better efficiency, use pans that have the same base diameter as the cooking zone. Always go by the size of the base of the cookware—some cookware manufacturers quote the size of the top, for frypans in particular. Be aware of any restrictions on minimum pot sizes for a zone as it can be frustrating if a large zone doesn’t detect a smaller pot. Some cooktops have flexible zones, sometimes referred to as bridging, where smaller zones can be combined to accommodate larger pots. A newer approach (and more expensive) is the ‘whole cooktop zone’, where the cooktop is one large smart zone that auto-detects what pots are on there, with a touchpad screen so you can set the power level for each pot. An example is the Siemens iQ700. 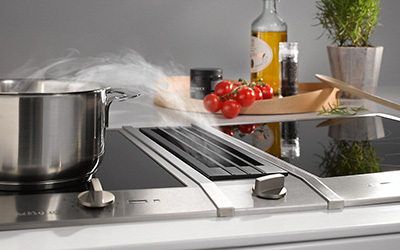 The controls are a crucial feature of an induction cooktop. Choice’s ease-of-use test looks at this, but it’s worth trying them out yourself to see what suits you. Most have electronic touch controls, with sliders, a ‘+/-‘ control or individual numbers for selecting the power level. Some users have noted that the ‘+/-‘ controls are more time-consuming than something that allows direct selection of a power level. Some cooktops use rotary dial knobs, perhaps more intuitive for those used to gas cooking; for example, the Miele KM 6363-1 has four dial controls or a Samsung model has a neat magnetic knob which attaches to the power control you are operating at the time, and is removable to enable easy cleaning (although listed on the Samsung Australia website, Samsung cooktops are not widely available in Australia yet, as far as we can tell). More advanced cooktops, and those using single large smart zones, may have a full touchpad screen which allows you not only to set power levels and timer options, but also see the position of pots on the cooktop and how much power each is receiving. You should also look at ease of selecting a zone to control—are there separate power controls for each zone or do they share the power controls so you need to first select the zone? Some users have reported that the latter can seem arduous. Some cooktops will highlight the controls for the zones that have pans on them to make it easier for you—an advantage of electronic controls! You’ll also want to check the position of the controls relative to the cooking zones, to make sure that spills won’t be a problem and that the placement suits you. Also check the size of the controls (one reader reports that her brother-in-law can’t use the induction cooktop that came with his rental house because the controls are too small for his fingers). Pretty much all cooktops have some form of visual feedback to indicate the power level, whether it be an LED bargraph as part of the slider or a separate LED numerical display, or even the aforementioned touchscreen. One manufacturer, Samsung, now has little blue LEDs positioned around each zone which increase in brightness depending on the power level—intuitive and simple visual feedback that will perhaps help some transition from gas cooking! Many induction cooktops also come with several automated features for controlling the power level. For example, you can select to ‘boil water’ and it automatically sets the right power level. Another option is ‘auto heat up’ to heat up quickly then turn down to a preset temperature e.g. to a simmer temperature when cooking rice. An alternative to this is a ‘power boost’ control; select this and the power goes to maximum until you press it again. Conversely, ‘keep warm’ and ‘pause’ controls allow you to reduce the power level temporarily. Many also come with timers. Note that power management is built into most cooktops to prevent overloading the circuit when on the highest power settings. This limits the maximum power used by paired zones, turning one zone down if the other is on power boost. Induction cooktops come with excellent safety features. They only turn on if there’s a pan on the cooking zone, so there’s less risk of accidentally leaving the heat on. Many also turn off or turn down the power to protect the pot if it boils dry or if there’s an overflow that spills onto the controls. However, one user reported that auto turnoff didn’t prevent damage under the surface of their cooktop when a pot boiled dry—the result is a discolouration that they can’t remove, though the cooktop still works. Many also come with child locks. Some cooktops are frameless whereas others have a frame around the edge of the glass surface. 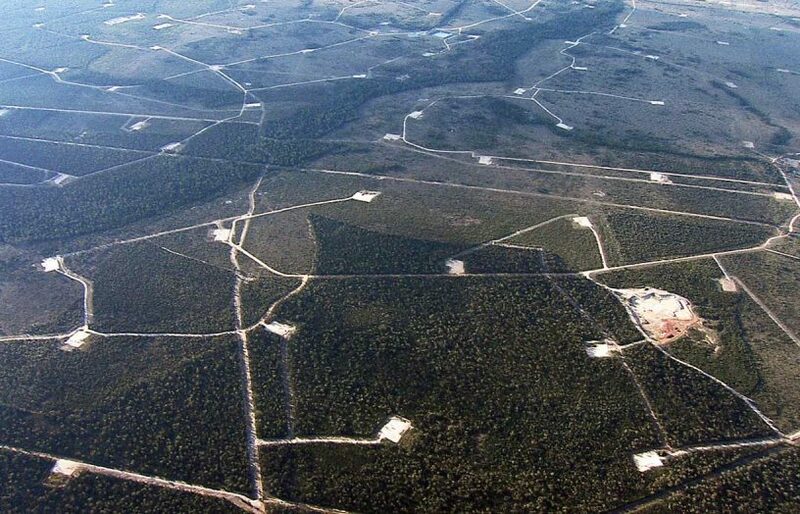 Rebecca Ciaramidaro from Choice says that framing can be good for containing spills, but, conversely, can be harder to clean as food can get stuck under the edging. She also notes that frameless cooktops may be more vulnerable to cracking if something is dropped on the edge. Dedicated wok cookers have been known to say they’d never go induction. However, induction and woks go together quite well! Rebecca from Choice says induction cooktops perform really well in the stir fry cooking test because they heat up quickly and evenly (she notes that the same doesn’t apply for ceramic cooktops). You either need a flat-bottomed wok or you can get a (much more expensive) induction cooktop with an indent for a wok. You will still need an extraction fan with your induction cooktop. Even though it won’t generate the combustion products from burning gas, there is still a lot of steam produced that you’ll need to extract from above the cooktop to avoid condensation issues in your kitchen. A conventional rangehood will work; the allowable height range for your rangehood above an induction cooktop can vary from that required for a gas stove, so remember to check. Miele even has a cooktop that communicates wirelessly with the rangehood to automatically turn it on and adjust the power according to what’s happening on the cooktop. Alternatively, some cooktops come with a downdraught extractor which sits under the cooktop. Separate downdraught extractors are also available to add behind existing cooktops, if space allows. These look like a narrow extension of the cooktop, until they are turned on. They then pop up out of the bench to extract steam and fumes, dropping back down when you’re finished with them. An induction cooktop will make some noise during operation. This is partly due to the fan used for cooling. Some users report other noises such as buzzing and clicking. “A clicking noise during operation is likely due to the cookware not registering properly,” says Rebecca: the cookware may not be on the zone properly, or may not be the right size for the zone, or may not be fully induction-compatible. If you’re concerned about noise, test one out at your local appliance store (they often hold cooking demonstrations) or try out a friend’s (or listen to one online). Owners of the cooktops that we spoke to did not find the noise a problem—as one user said, their microwave and dishwasher both make a noise, so it’s not unexpected. One thing you need to be aware of is that your cookware needs to be induction-compatible. Check for the ‘induction-compatible’ label when buying new cookware. For existing cookware, check that a magnet sticks well to the base (all over the base is best)—if not, you’ll have to invest in new pans. Cast iron, steel, some enamelled steel, and stainless steel pans with an iron base or core are suitable, but glass, aluminium and copper generally are not. If replacing your pots, it’s worth buying a single pot or pan first to try it out with your cooktop. New aluminium cookware can have a layered base to make them compatible. Choice has an induction cookware guide. As already mentioned there are many ways in which induction cooktops are safer than other types—the surface doesn’t get as hot as ceramic or gas cooktops, so there’s less risk of burns; there’s less risk of a fire; there’s no risk of leaking gas or combustion products; and they often have features to prevent overheating. While there have been concerns raised about the possible health effects of electromagnetic fields (EMF) from induction cookers, there is no evidence that there is any health risk. An exception is a small risk for those with implanted Pacemakers or similar devices, and then only at close proximity. Cooktop manufacturers generally recommend that you maintain a distance of 30 cm or more if you have a Pacemaker. See Choice’s buying guide online for more on this. Here, a portable induction unit has been placed on top of the old gas cooktop (burners removed, a piece of ply added to level the surface). This has meant the owners have been able to (cheaply, $59 each for two portable units) disconnect completely from gas while keeping their still-working electric oven. They are planning to purchase a separate oven and cooktop when the price of induction cooktops comes down. Like other styles of cooktop, induction units simply drop into an appropriately sized hole in the benchtop. They need some clearance underneath for ventilation, as mentioned earlier, and may also need some space around the edges and along the back, depending on the design of the cooktop—check the manual before cutting your benchtop! As with other electric cooktops (and electric ovens), induction cooktops need a dedicated electrical circuit rated to their power requirements. This will usually be a circuit in the 30 to 40 amp range. If you are switching from gas to induction, this will need to be installed by an electrician. Some homes have lower-power (40 amp) connections to the grid, and a large induction cooker may require most of this capacity. This could mean at times you exceed the limits of your grid connection, causing the main grid breaker to trip (if fitted; some older homes only have a simple switch). Your electrician will need to bring your connection up to the required capacity; this can be expensive, costing upwards of $2000, so check what’s required at your home with an electrician before purchasing. Reuse options for an oven or cooktop are fairly limited and probably only good environmentally if it is in good working order (no leaks, oven well insulated). You can sell or give away your unit on online forums (eBay, Gumtree, Freecycle etc) or you can try your council’s tip shop. Most charity shops are unable to take cooktops/ovens due to safety regulations. There are good recycling options, however, to recover the metal content. Many retailers will take your old unit away and recycle it when you purchase a new one; this may be for free (e.g. Appliances Online) or at extra cost as part of installation (e.g. The Good Guys, Harvey Norman). Double-check that they will recycle it via a scrap metal yard. You should also be able to recycle it at your council’s resource recovery centre or via their hard rubbish collections. You may even be able to get paid for your scrap at a metal recycler such as Sims (which has national coverage) or many others around Australia. Some will pick up but generally only for large lots and without payment. For more options and recycling locations, see recyclingnearyou.com.au/whitegoods; for reuse options see recyclingnearyou.com.au/pass-it-on. As with all consumer goods, it’s difficult to judge quality and reliability. Choice tests don’t cover this, but you can research on forums like Whirlpool and online review sites to see what other purchasers have had to say. Such reviews may not always be reliable, but if there’s a large number of people with the same issue, that’s worth following up. Warranties range from one to five years, with two appearing to be the average length. A longer warranty can mean an expectation of higher quality, but that’s not always the case. The table available here includes a list of major brands and models from the recent Choice review. Choice includes the most popular models in their tests and updates them fairly frequently, so this can be a good starting point. They don’t necessarily include the more expensive models with some of the more advanced features (e.g. single cooking zone). Look at reviews online and consider the features most important to you. Robyn Deed is editor of Renew magazine. Thanks to Rebecca Ciaramidaro from Choice Australia for her input to this guide. See Choice’s induction cooktop buying guide and reviews (available for a fee). A recent article in Renew 140 by Sophie Liu gives a great rundown of some things to help with the shift from gas to induction. Sophie says it took a little while to adjust given the greater power and speed of cooking, and to work out what power levels to use for common cooking tasks, but she is now officially a convert. She recommends trying a cooktop out at a friend’s or going along to a cooking demonstration at an appliance store, so you can work out what suits you before purchasing. Many recent purchasers also note that it can be confusing in a retail showroom as ceramic and induction cooktops are often similarly labelled. ‘It’s beautiful for cleaning compared to our old gas cooktop that collected crud!” That’s the first thing John Knox says when asked what he likes about his family’s induction cooktop. He also comments that the surface tends to stay cool, though it does heat up a little by conduction; that boiling starts almost immediately; and that the control is excellent—when you remove power it is immediately responsive, “kind of like gas,” he laughs. They bought the cooktop as part of a move to go all-electric. They tried out a portable cooktop first, which made them realise they’d also have to change all their cookware as only one skillet worked on it. They committed in late 2015 to a countertop model costing around $1000, after research online and looking in a couple of retail stores—”salespeople had a distinct lack of knowledge about induction at the time,” says John. The only extra feature they use a lot is ‘power boost’ to get to temperature quickly—they set the level they want, say ‘6’, and then hit power boost to bring it up to temperature quickly and then hit power boost again to return to level ‘6’. They hear the fan occasionally, but it doesn’t bother them. They occasionally also hear buzzing when it’s on a high power setting: “that’s the induction interfering with the sandwich layers in the base of the pan,” says John. Their cooktop has four zones. It doesn’t include bridging or flexi-zones, but they’ve never felt the need for that. Anna and her partner Sacha did a fair bit of research before buying their induction cooktop in June 2017. “We tried out several models at friends’ houses and noted what we liked and didn’t like.” The main thing they didn’t like on some of the models they tried was the need to select a zone before adjusting the power level (using a shared control), so they went for a cooktop with separate power controls for each zone. They also preferred a one-touch slider approach to select the power level, rather than a ‘+/-’ control. “Those requirements ruled out a lot of models,” says Anna. They also didn’t want a massive unit, and managed to find a 70 cm model which had the same layout as the 60 cm models but was less cramped. It doesn’t include smart or flexi-zones—“we looked at bridging zones on my mother-in-law’s model and the feature seemed complex to use; plus models with this were more expensive.” They were told in the store that they could put a pot across two zones to get the same effect, though they’ve not tried that as yet. They’ve never had a problem with the zones not registering a pot. There’s a cross in the middle of each zone and nothing to note minimum or maximum sizes; the cooktop seems to work well with all their pot sizes on all zones. Some models they looked at had a metal strip between the controls and the cooking zones, but they felt this would collect dirt and make the unit harder to clean. The unit beeps if there is a spill on the controls to let you know that it is about to turn off, and it’s easy to wipe clean and continue working. One “tiny thing” is that they would like more visual cues as to which control is for which zone. They’ve also had a problem with a pot briefly boiling dry on the cooktop; the automatic cutoff feature didn’t kick in and the resultant overheating caused cosmetic damage to the glass top. However, the cooktop still works. 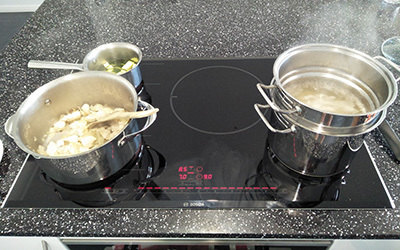 The cooktop has a flexi-zone on the left-hand side, which can be either two separate zones, or one long zone. He’s found it useful for cooking using a rectangular pan that he’d previously only used in the oven—”it fits perfectly”. He mostly uses the small circular right-hand front zone for cooking rice and pasta; he does most of his other cooking in a slow cooker. The flexi-zone has proved handy as a place to move the cooked rice to, while he does some other cooking on the right-hand zones. Interestingly, he only uses the larger right-hand back zone if “he’s forced to” as he doesn’t like having to lean across the cooktop to reach it. One thing he looked for in a cooktop is a framed design as he felt that would mean it’s less likely to chip the glass on the edge. 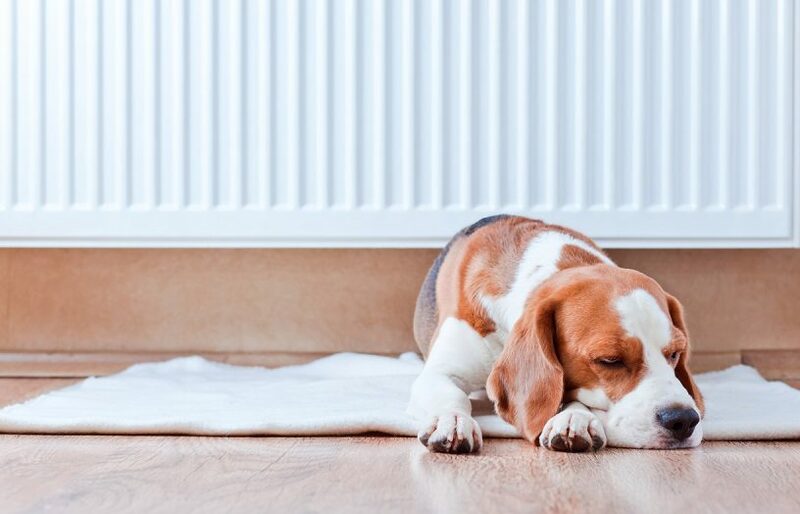 On the higher settings, they can occasionally hear a high frequency noise, but it doesn’t worry them; and conversely, they don’t have the hissing noise from gas. They currently don’t have a rangehood as the cooktop is in a large space and the condensation is dispersed, but they’ll keep an eye on that. This article was first published in Issue 142 (Jan-Mar 2018) of Renew magazine. 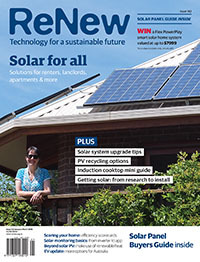 Issue 142 has a focus on energy efficiency and solar for landlords and renters. 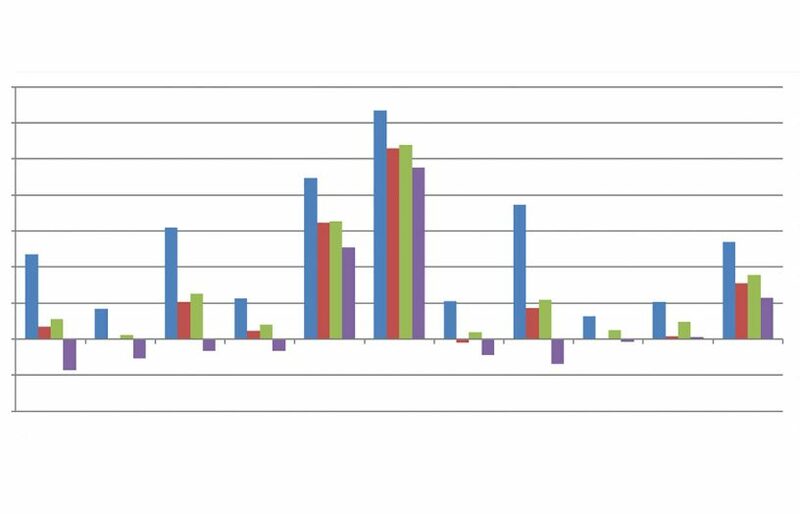 The results of ATA’s latest study on the economics of switching to electricity from gas for heating, hot water and cooking, for both solar and non-solar homes.